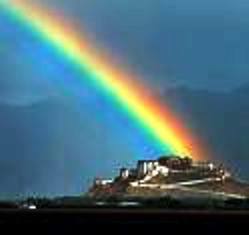 Discover Tibet Dalai Lama Palace, History of Potala Palace, Dharamsala Home of Dalai Lama & Summer Palace..Norbulingka !! The early legends tell of a sacred cave, considered by buddhist scholars, the dwelling place of the 'Bodhisattva Chenresi' (Avalokiteshvara.This supposedly in the seventh century was a meditation retreat for Emperor Songtsen Gampo. In 637 AD, Songtsen Gampo constucted a palace on the hill in 637 AD. This in the seventeenth century, became part of the bigger buildings which was made later. The constuction began in 1645 AD, during the reign of the fifth Dalai Lama the White Palace or the Potrang Karpo was completed in 1648. The Potrang Marpo, The Red Palace, was added between 1690 and 1694; by the work of 7000 workers and 1500 artists. In 1922, the 13th Dalai Lama renovated many chapels and assembly halls in the White Palace and added two storeys to the Red Palace. The Potala Palace stayed almost untouched during the Tibetan uprising in 1959. All the artifacts and chapels were well preserved. The Potala Palace rises on top of the Marpo Ri Hill, 130 meters above Lhasa Valley. It rises further 170 meters and is considered as the greatest monumental structure in all of Tibet. The Potala Palace's interior space being in excess of 130,000 square meters makes it an huge structure.The Potala was first and foremost the residence of the Dalai Lama and his large staff.It was also the seat of Tibetan government. All ceremonies of state were held here. It also houses a school for religious training of monks and administrators.It is one of Tibet's major pilgrimage place due to the tombs of past Dalai Lamas lies inside it. Within the White Palace are two small chapels, the 'Phakpa Lhakhang' and the 'Chogyal Drubphuk' made during the seventh century. These chapels are the oldest structures and are the most sacred ones. The Potala's most venerated statue, the 'Arya Lokeshvara', is inside the Phapka Lhakhang chapel. It draws thousands of Tibetan pilgrims every year. As early as the eleventh century, this Tibet Dalai Lama palace was called 'Potala'. This name is derived from Mt. Potala, the mythological mountain abode of the 'Bodhisattva Chenresi' (Avalokiteshvara) in Southern India. When the Dalai Lama left Tibet, Indian Prime Minister Jawaharlal Nehru offered to permit him and his followers to establish a "government-in-exile" in Dharamsala in 1960. Since then, many Tibetan exiles have settled in the town, numbering several thousand.The Tibetans have established monasteries, temples and schools. The town is sometimes known as "Little Lhasa", after the Tibetan capital city, and has become an important tourist destination. The Residence of His Holiness Dalai Lama is opposite the Tsuglag Khang, or the Central Cathedral, which is about ten minutes' walk from McLeod Gunj. Time permitting, His Holiness gives holy teachings in Namgyal Monastery near His private home. The Sixth Dalai Lama Tsangyang Gyatso built a three story octagon pavilion in the middle of the pond and took a rest in it. The pavilion has the name for a statue of Dragon King. 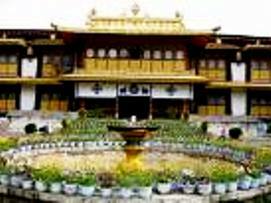 'Norbulingka', means the Jewel Park, was Dalai Lama's summer palace since the Seventh century. On Shoton Festival, the park is crowded with picnickers, and traditional Tibetan opera performances are also held there. Besides the green trees is a two-story building with carved beams, painted pillars, traditional upturned eaves, and corbel brackets. This is the house where 'Dalai Lamas' stayed during the summer. This elegant palace contains many valuable objects, including gold, silver, jade, antiques, Buddhist artifacts, murals, and Luxury furniture. The palace is heavily painted with murals, which bear strong Han characteristics. Takten Migyur Potrang, meaning Eternal Palace in Tibetan, was completed in 1956 for the Fourteenth Dalai Lama. In the palace there are many splendid murals painted by a Fourteenth Dalai Lama's painter. In a little sutra hall, there is a Dalai Lama's throne which is wrapped in gold foils and decorated with gems. 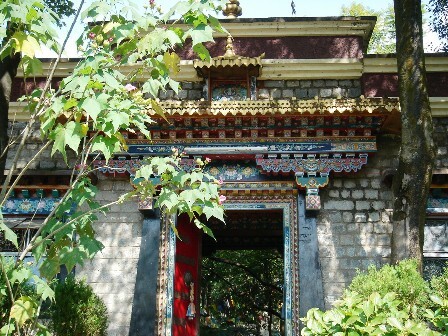 The Summer palace of Dalai Lama in Dharamsala...the Norbulingka Institute is converted into a Tibetan Art & Craft Preservation Center. 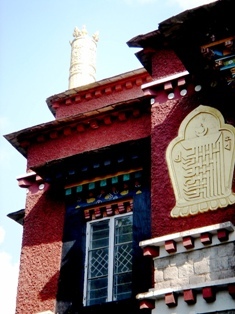 It has an Art studio, Tibetan tailoring section, The Losel Doll Museum and the Sakyamuni Temple with a library. It was commissioned in 1996 by His Holiness the 14th Dalai Lama. It is also the center for Buddhist studies for students from Ladakh, Kinnaur/Spiti and rest of India. For Tibet Dalai Lama Palace....Go to Dalai Lama Retreat, Dharamsala ! !